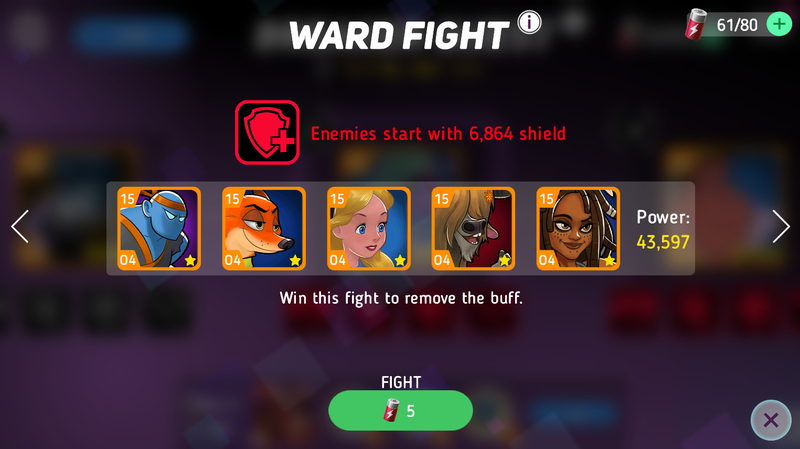 Welcome to the Disney Heroes: Battle Mode 1.9 Update. We’ve got a ton of stuff for you with this release! First off, we are now ready to introduce Invasion and Mods to all servers for 1.9. Check out the detailed preview for both below! This release also features a second round of Quality of Life improvements, to game modes, UI, and other features. 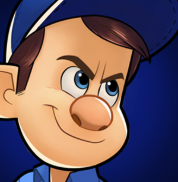 Last but not least, we have a hero refresh for both Merida and Finnick, with supporting updates for Fix-It Felix, Jr., Mr. 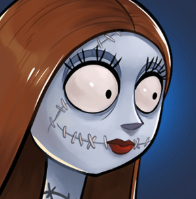 Incredible, and Sally. It’s time for our third Hero Refresh! We are mixing it up this time by giving a full Hero Refresh to two heroes! The recipients of this Hero Refresh are none other than Merida and Finnick! The supporting heroes for these two are Fix-It Felix, Jr., Mr. Incredible, and Sally. 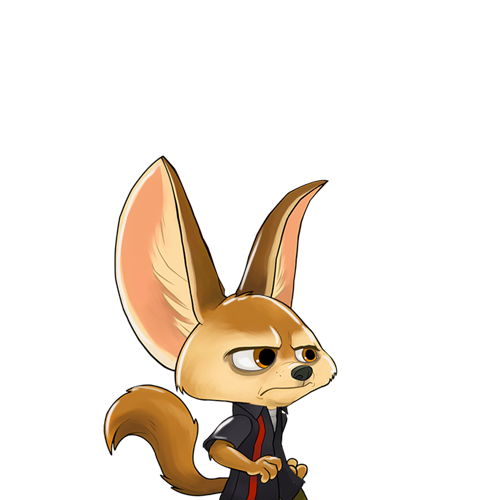 Finnick is a control character with a heavy emphasis on slowing his enemies. We felt his slow effect wasn’t slowing quite enough and his skill, “Remote Controller”, could use a bigger impact in battle. To do this, Finnick is getting an overall stat and damage increase, slower slows, and a new twist on “Remote Controller”, giving Finnick even more control over the battlefield! 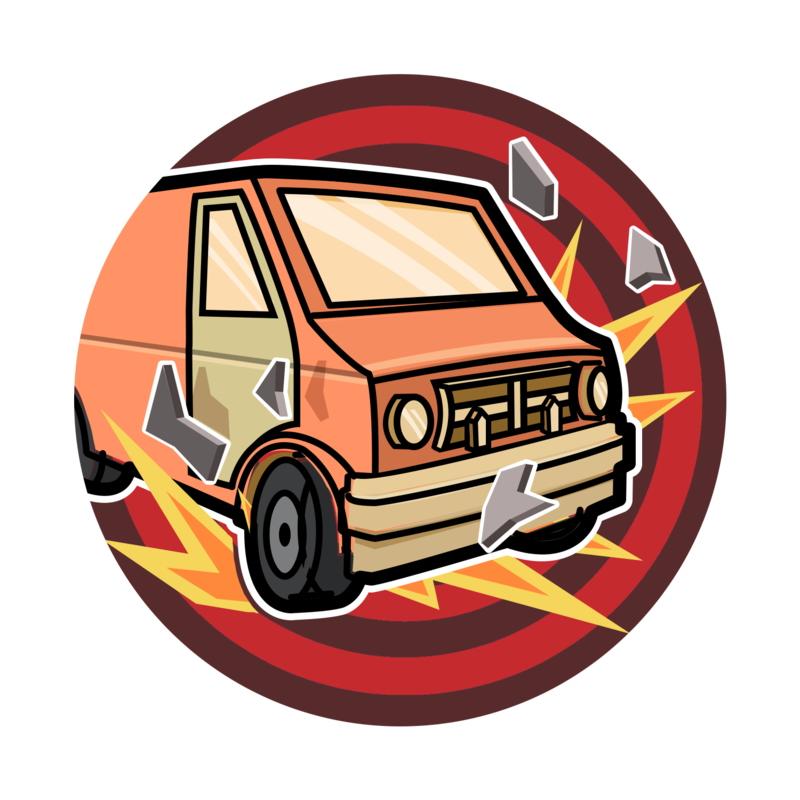 Finnick controls his trusty van remotely causing it to deal damage and knock back all enemies. If his van damages any enemy who is slowed, they will also be stunned. Finnick flings Jumbo Pop goo at the nearest enemy, doing damage to them and nearby enemies. Finnick smashes his Jumbo Pop, sending out a shockwave that deals damage to enemies in front of him. 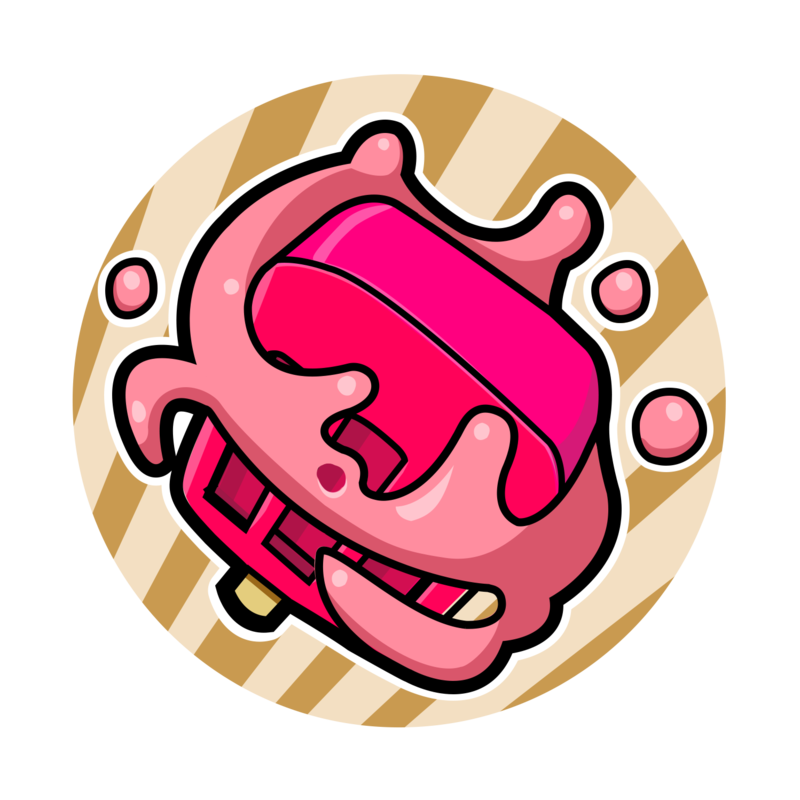 Finnick gets his Jumbo Pop goo everywhere, causing his basic attacks, “Pummel Pop”, and "Jumbo Slam, to also slow enemies’ movement and attack speed. 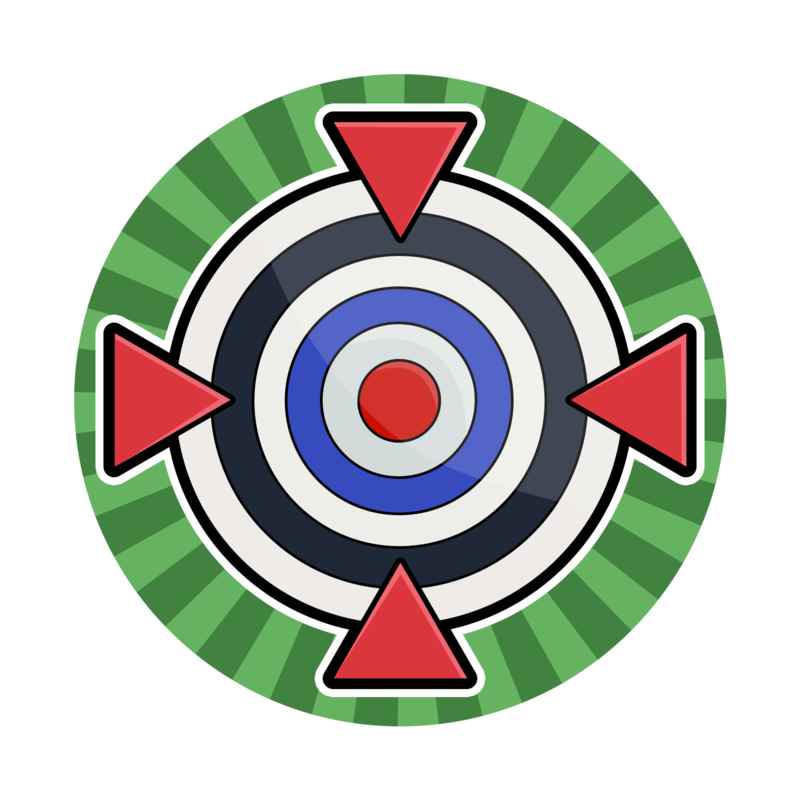 Merida is a quick archer with powerful attacks that deal a lot of damage and reduce her target’s armor, but we think she could use a push to deal even more damage and synergize better with other damage dealers on her team. To accomplish this, we are giving her an all around damage increase and a new mechanic to fire more arrows during her “Gaelic Volley”. Here’s a tip! Firing more arrows during “Gaelic Volley” means even more freezing or burning from her memory disks! Merida fires arrows at enemies dealing damage with each arrow. Merida lines up a powerful shot that deals damage to each enemy hit. Once Merida falls below half HP she gains attack speed and basic damage. 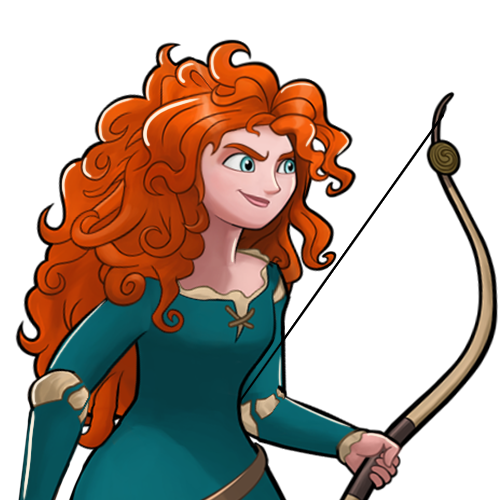 Merida’s arrows rend her target’s armor, reducing it. This effect stacks up to four times. 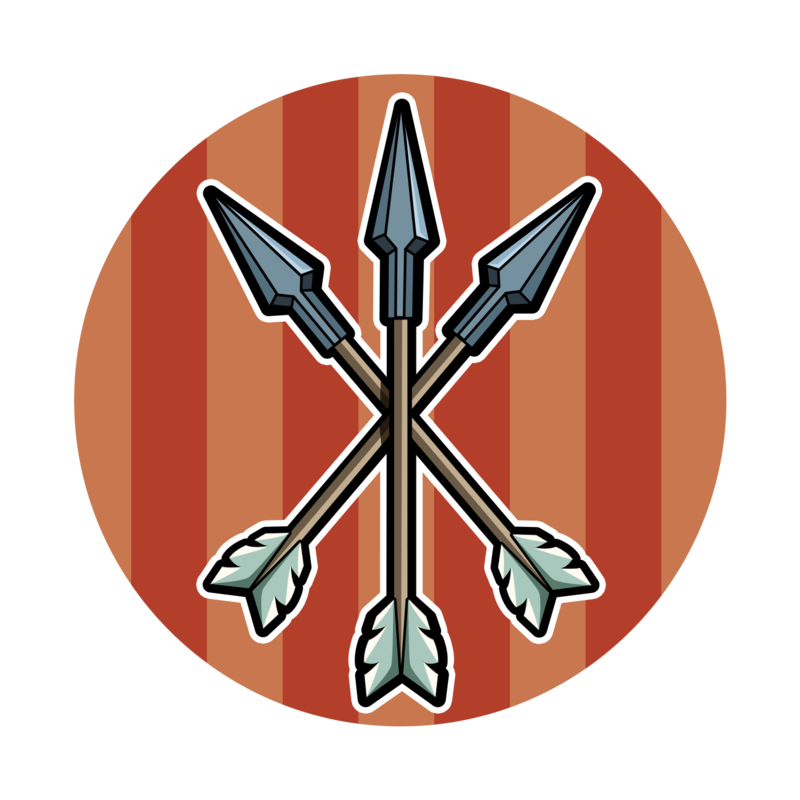 Every few times an enemy’s armor is reduced from any source, Merida gains bonus arrows to use during “Gaelic Volley”. Merida now gains bonus arrows when she or her allies reduce an enemy’s armor. These bonus arrows are fired during “Gaelic Volley” in addition to her main pool of arrows. Fix-It Felix, Jr.‘s ability to constantly heal himself and "Rapid Fire Fixin’" memory disk allow him to excel as a tank, absorbing damage to allow backline heroes to shine. Equipping Mr. Incredible with his “Date Night” memory disk allows him to absorb damage and dish it back very quickly, reducing enemies’ armor for his allies in the meantime. 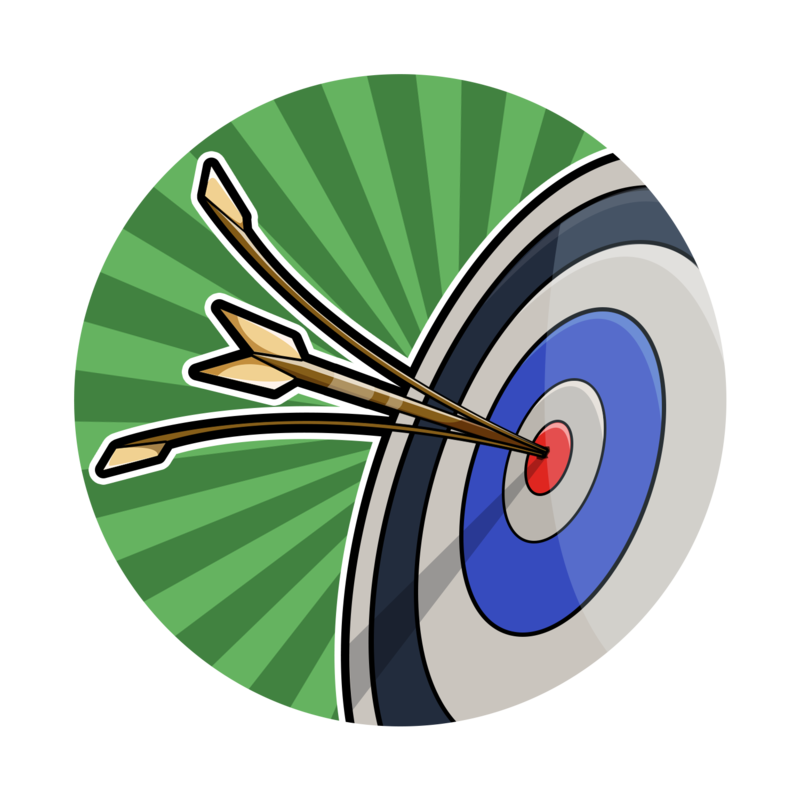 This makes him a natural pair to Merida, who gains bonus arrows from her “Focus” skill whenever he reduces armor. Merida needs time to be able to deal out as much damage as possible. Sally with her “Corpse Flower” memory disk gives tanks the survivability they need to protect Merida and Finnick so they can be free to damage enemies from the backline! 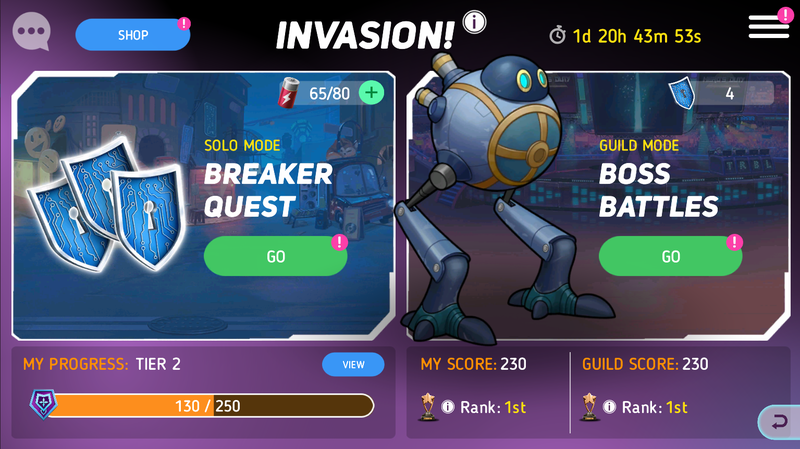 Invasion is weekly, 5-day-long event where individual players and guilds can compete across two different modes, Breaker Quest and Boss Battles. Giant robots are invading the City! Fight through increasingly difficult battles across the City in Breaker Quest to collect Breakers. Use your Breakers to defeat robot Bosses and earn big rewards. 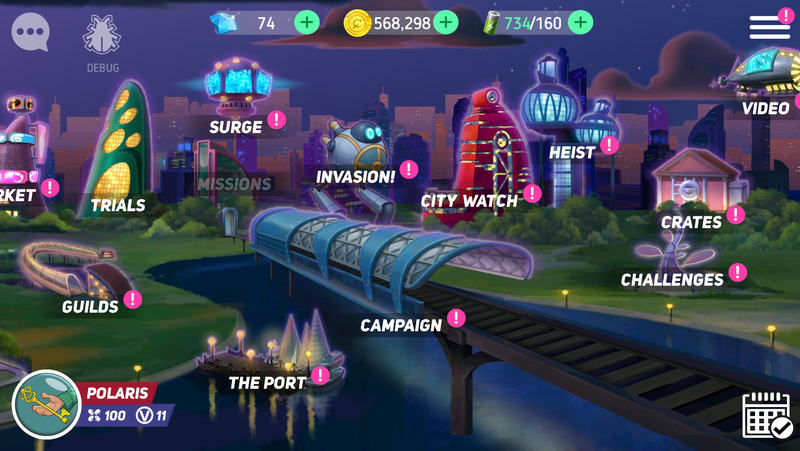 The main reward for Invasion is a new way to customize your heroes and make them stronger called Mods. Mods are described in the next section. Each Invasion focuses on one of the 3 hero color Teams: Yellow, Blue and Red. In the screenshots above, for example, the Invasion is focusing on the Yellow Team. This means Mods available to be earned will be for Yellow heroes only. It also means that Yellow heroes and Mods can be Powered Up. Each Invasion also features 3 specific heroes who start very powered-up for the Invasion. Mods attuned to those heroes can be found in Supply Crates. 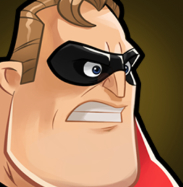 All heroes can be further Powered Up during the Invasion by earning Power Up items. Powered Up heroes and Mods are more powerful for the current Invasion only. But they will help you earn more rewards by doing better in both the Breaker Quest and Boss Battles. Use Invasion Stamina to win fights in the Breaker Quest to earn Breakers. Each individual breaker fight has 4 wards that make its enemies stronger. If you can’t defeat a breaker fight directly, destroy the wards around it to weaken it. Your heroes’ HP and energy persist between fights in the Breaker Quest (just like City Watch). Use Hero Revives (earned from winning Breaker Fights and defeating Bosses) to revive KO’ed heroes and continue the fight. You need breakers to attack a boss. You can spend 3 breakers at once to make a strong attack which does 5 times as much damage. If you can’t defeat the boss you find in one attack, your guild can help you out by attacking the boss as well. You have to attack your boss once before your guild will see the boss. Boss rewards are handed out only when the bosses is finally defeated. 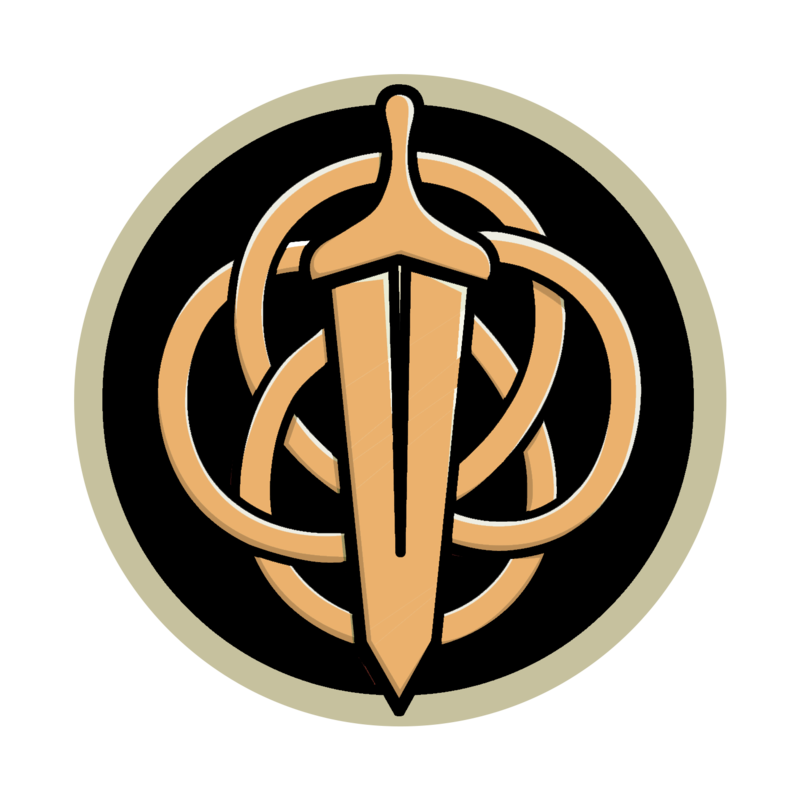 People who participated in attacking the boss earn rewards. Extra rewards are given out for doing large amounts of damage and other objectives. You can see all the possible rewards by pressing the view button next to the rewards. Your hero’s HP and energy persist between fights against bosses. This HP and energy is different from that in the breaker quest. You can use Hero Revives to prolong your fight against the bosses. 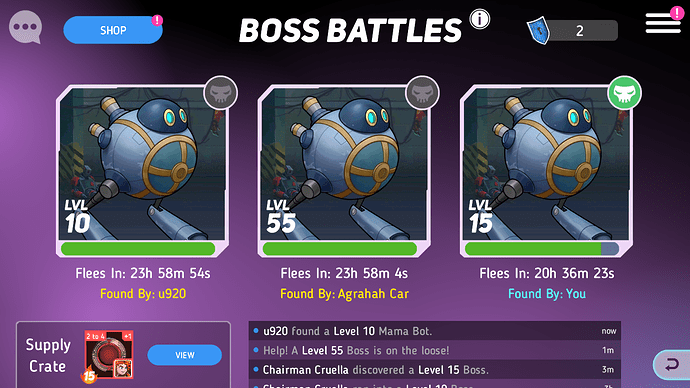 Boss tech is awarded when you successfully defeat a boss. 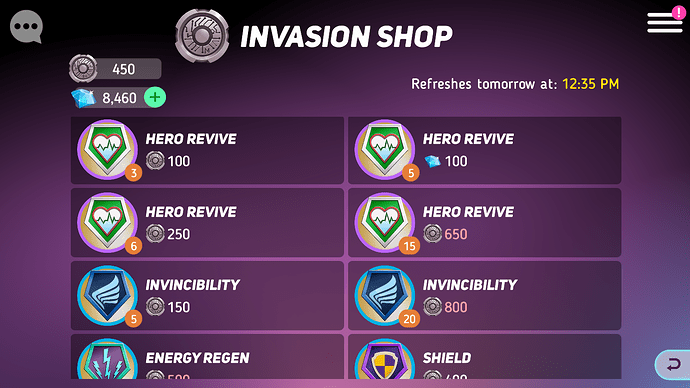 Spend it in the Invasion shop to buy more items to help with the current Invasion. Boosts are one time use items that will help you in any Invasion fight. Use them to defeat particularly nasty enemy combinations. Use ’Em or Lose ’Em! Your boss tech and boosts will expire at the end of the Invasion. So spend them liberally! They’re there to help you get as far as possible in the current Invasion. At the start of each Invasion certain heroes are automatically powered up, making them stronger in all Invasion fights. 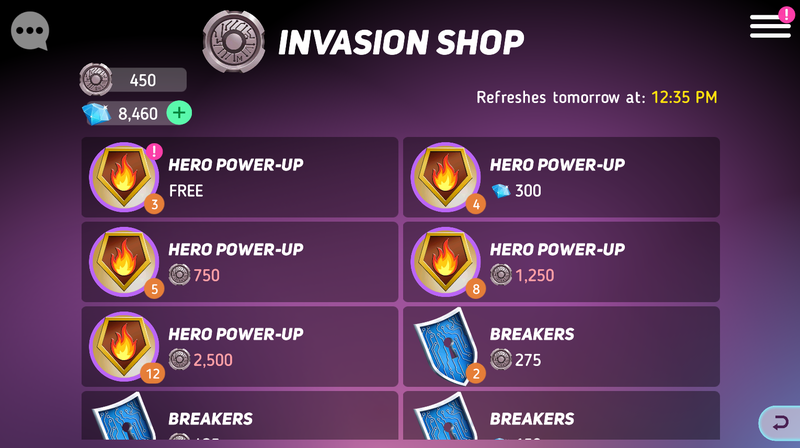 During the invasion you will earn hero Power-Up items that you can use to power-up your heroes further. 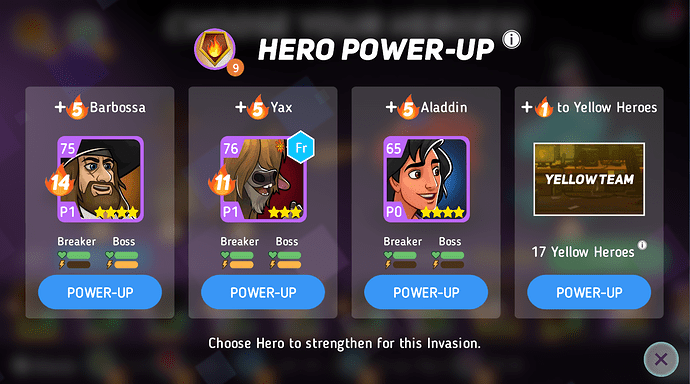 Each power-up item will give you an option of 3 different heros you can power up as well as the option to give a weaker power-up to a whole team of heroes. Power ups reset at the end of the Invasion. 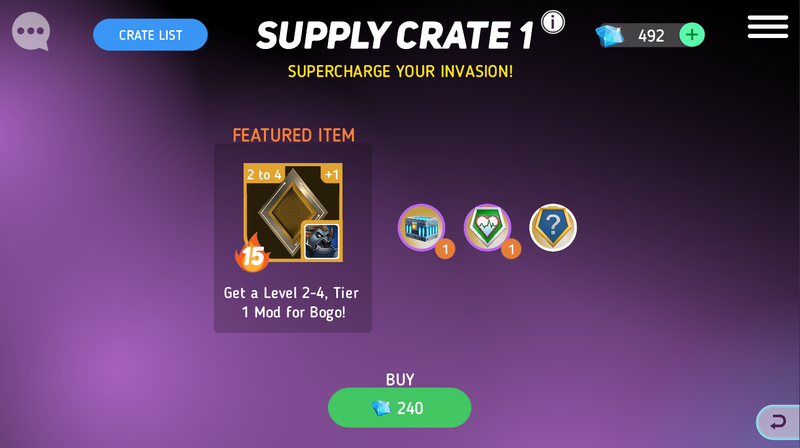 Players can buy supply crates to help them out in the Invasion. Supply Crates contain Mods, Mod Power, and other useful items. There are multiple supply crates available each Invasion, each with bigger and better rewards than the previous. 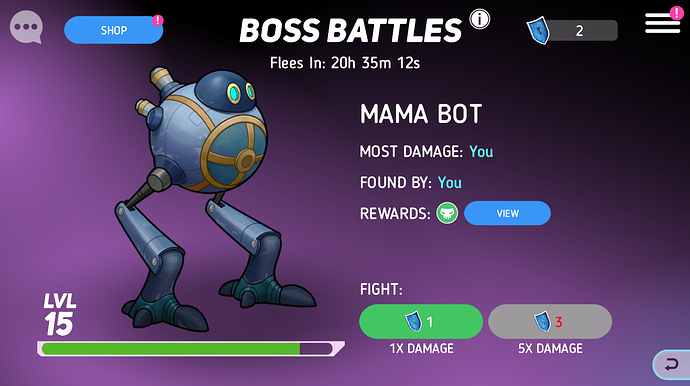 Earn Invasion points by winning Breaker Fights and when a Boss you attacked is defeated. Reach certain thresholds of Invasion Points to earn a Mod, Mod Power, Gold, Hero XP, Stamina, Disk Power, and more rewards. Compete both against other players and other guilds to earn the most Invasion points. The higher ranked you get, the more mod power you will earn at the end of the Invasion. Top players and guilds will be promoted to a new league in the next Invasion, where they will be eligible for better rewards. You can also be demoted if you don’t do well enough! With the global release of Invasion comes Mods! Mods are a new way to customize your heroes and make them stronger. Mods can be upgraded by using a new resource called Mod Power. Upgrading a mod increases the stat boost that it gives to a hero. A normal mod can be upgraded from Level 1 to Level 20. 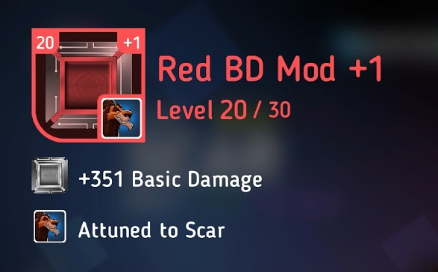 If you really want to use an attuned mod on a different hero, you can spend hero chips to re-attune it to a different hero. Mods can be earned from Invasion progress rewards. They also can be found in Invasion Supply Crates. Mod Power can be earned from Invasion progress rewards. Larger amounts of Mod Power can be earned from Invasion rank rewards, both individual and guild. But… each week, City Watch enemies will receive a different buff, making them tougher to defeat! 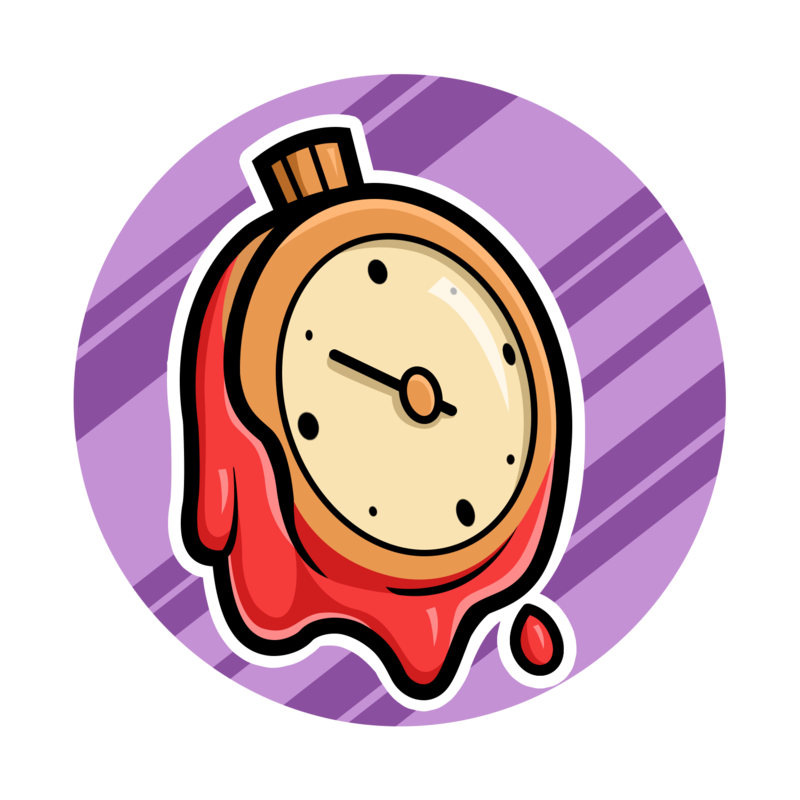 Creep Surge now lasts 20 hours instead of 16! 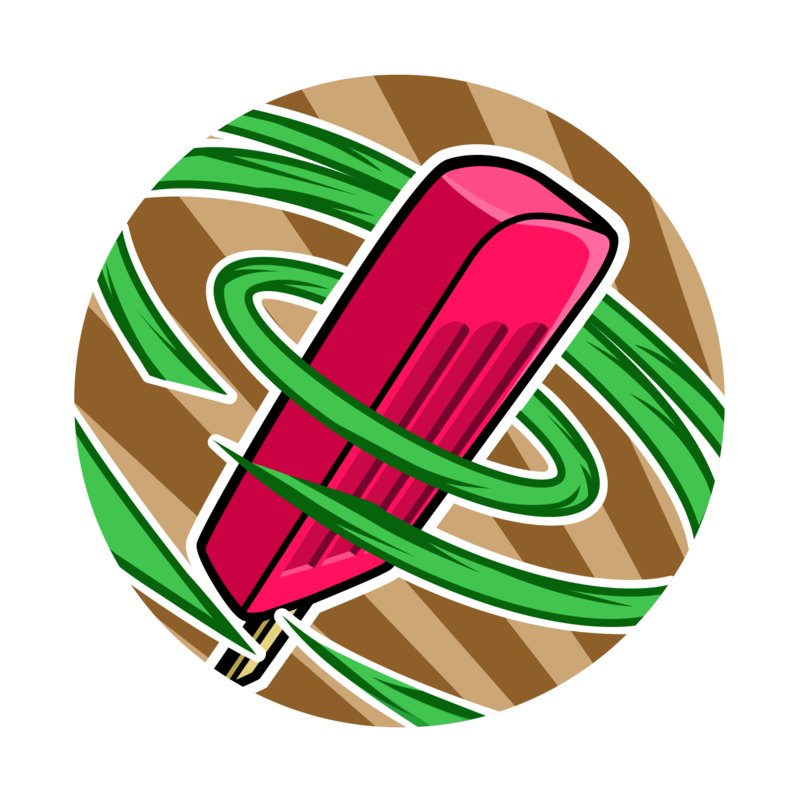 Unlock this perk to face the challenge of a 20-wave Surge! Now you can raid all Elite Campaign levels for a hero’s chips with one button! This allows you to use different Mods when defending in these modes than when attacking. To change your Mods just reset your defenses! 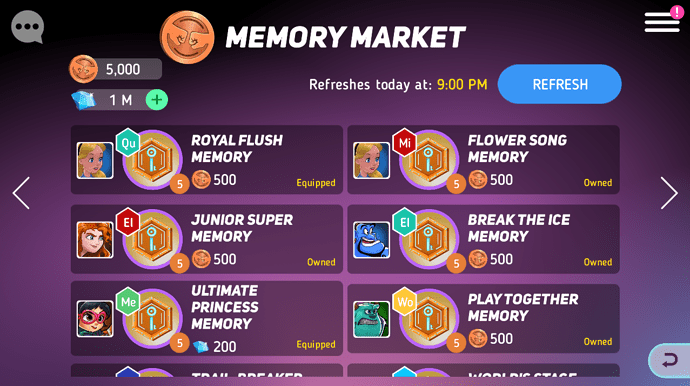 “Equipped” memories are disks currently equipped to the hero. “Owned” memories are disks that are unlocked but not equipped. Opening them one at a time is painful! With the 1.9 update, we have a pretty comprehensive update to heroes in shops on all servers! Heroes will not appear in Shops until they refresh. Introducing Nitro, a new Energy Drink item that packs a wallop! Nitro will provide your heroes 37,500 XP with each use! All shop tokens now appear in the Inventory for easy tracking. We hope this especially helps players who have earned tokens for shops they have not yet unlocked. 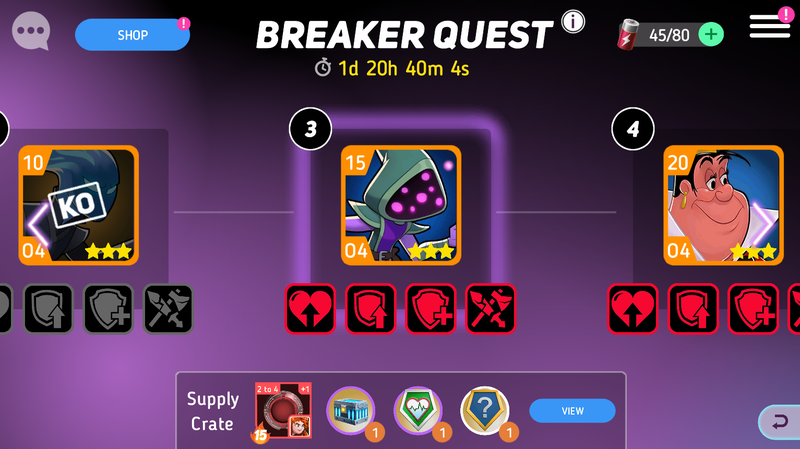 The Invasion boost, Cripple, was broken into 2 separate boosts: Armor Shred and Reality Shred. This gives players more variety and control over their attack boosts. 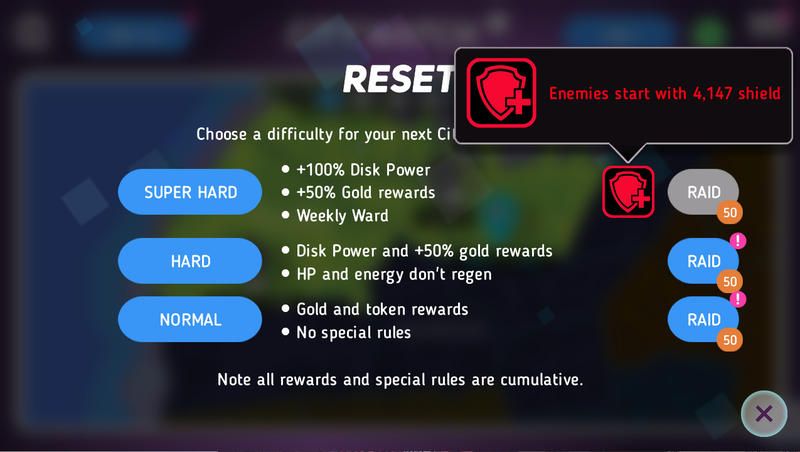 Fixed an issue where Normal and Hard difficulties in City Watch were unable to be reset. Fixed an issue where the Trials and Port timer did not update when they reached 0 seconds. We plan to release this update on Tuesday, April 16. 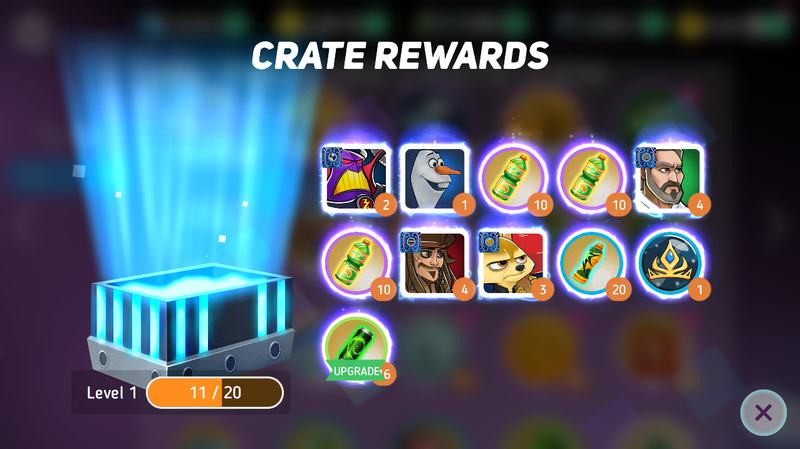 And AGAIN in vip crate we get an hero 4 months old and that has always been in both diamond crates and elite… thats ridicolous… at this point i would prefer another 3 weeks of mad hatter. Great quality of life improvements, good job. Cap raise for 5-8 already?! The “use 10” is different from the “buy 10” or 10x” crate options. Those gaurentee atleast 1 hero. 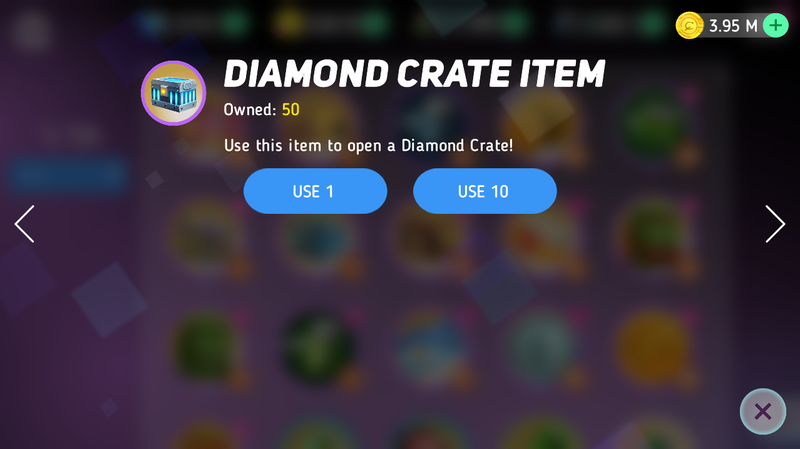 The new “use 10” option does not I believe. Nice update. Excited for finnick, Merida and Felix buffs. Heck yeah! Excied 2 unlock Mad Hatter. So glad I saved a lot of Coliseum coins 4 dis. @Polaris every time there is an update you tell us who is going in to the stores but never who is going out. Perhaps in future it might be more useful if instead you told us which 3 heroes will be available in each store after the update. 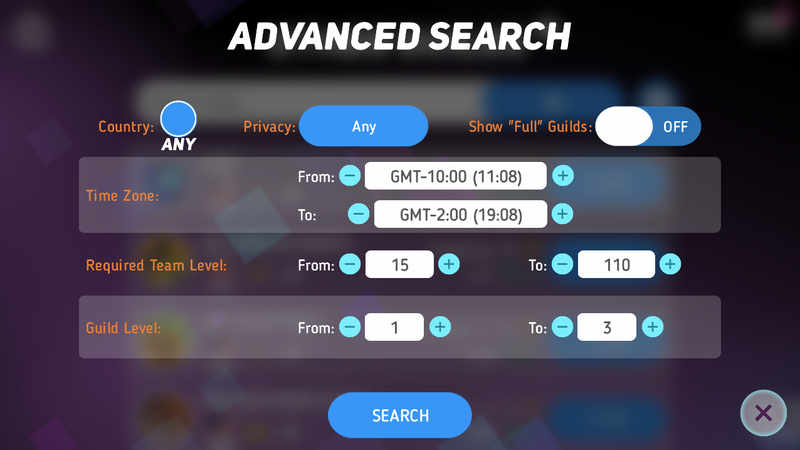 I thought there will be new characters in Servers 1-12, but I guess not. I really wanted to see new characters, but i guess that’s ok. I honestly don’t know what to think about this update. On one hand, I’m like yay, Invasion! But on the other hand I’m like, Wha-What? What happened to the forum?! ?